When we are not using our gallery it offers a very flexible and cosy space for all sorts of organisations, clubs and groups to use. Our gallery has a small but fully equipped kitchen attached, 2 x toilets and (apart from the kitchen) has disabled access. 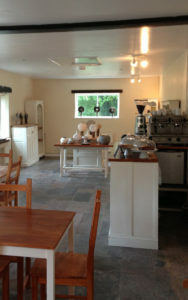 It has a tea-urn, coffee machine, crockery, and a flexible cafe style layout of tables and chairs, sofas, gas central heating and a woodburner. It also has an easy to clean stone floor. In total there is seating at tables for approx. 20-22 people (and including the sofas there is seating for about 26 people). We do have some additional seating that could be used if you were using the space in a meeting/presentation style).